The IU Hoosiers still maintain their big lead heading into day 3 finals. Heading the Hoosiers is Ian Finnerty, who already broke his own B1G record in the 100 breast. 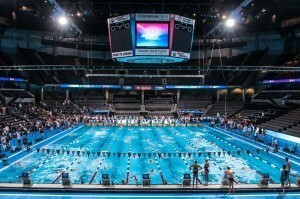 IU also has major scoring points in the 200 free (4 A-finalists) and the 100 back (3 A-finalists). 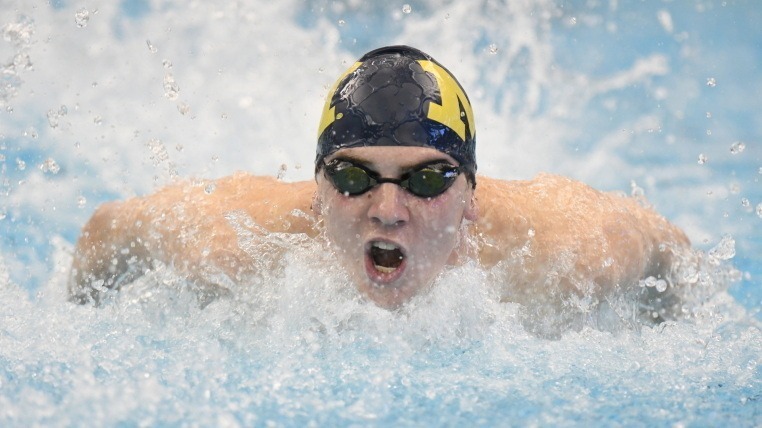 Michigan also follows a strong representation in the 400 IM, with 4 A-finalists in the event headlined by Charlie Swanson. Miles Smachlo and Vini Lanza were nearly neck and neck throughout the whole race, both having a slight lead on the rest of the field. Smachlo got the 0.07 advantage at the finish over B1G record-holder Lanza. Both swimmers achieved an NCAA A cut as well as now being the top 2 times in the NCAA this year. Taking third place was Noah Lense of Ohio State, who ranks #10 in the NCAA this year. Lense took out Bruno Blaskovic by 0.01, who finished in fourth. 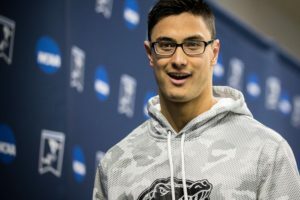 Blaskovic’s prelims swim of 45.33 ranks #9 in the NCAA. It was a Michigan 1-2-3 finish in the distance IM, with Charlie Swanson gaining the lead off the back half. Teammates Ricardo Vargas Jacobo and Thomas Cope pulled away from Penn State’s Michael Daly to accomplish the Wolverine top 3 finishes. Swanson still holds the top spot in the 400 IM as the only swimmer under 3:40. Vargas Jacobo is now #2 behind Swanson and teammate Cope is #7 in the NCAA with his third place time. Daly also cracked the top 10 with his fourth place time of 3:42.48. Michigan now sits just 22 points behind the IU Hoosiers in the team rankings. Zach Apple gave IU their first victory of the evening as he cruised home (24.52 split) to a 1:32.68. Taking second place behind Apple in a 23.79 final 50 was Ohio State’s Paul DeLakis. Coming home even faster (23.45 split) to take third place was Michigan Wolverine Felix Auboeck. Apple now moves up to #6 in the NCAA with his winning time. DeLakis and Auboeck are now #10 and #12 in the NCAA as well. IU still holds the lead, but only by 6 points over Michigan. Into the first 50, Ian Finnerty looked to be challenged by Max McHugh. Yet American record-holder Finnerty showed his dominance and edged out McHugh for the fastest time in the NCAA this year. McHugh’s second place A cut time of 51.08 is now #3 in the NCAA while IU Hoosier Zane Backes‘ third place time of 51.73 is now #6 in the NCAA. Right behind Backes for #7 in the NCAA is fourth place finisher Trent Pellini of Purdue (51.76). Earning the Hooiser’s 3rd win for the night was Gabriel Fantoni. Fantoni dominated the final, winning by a whole second and being the only swimmer under 45 seconds. Fantoni is now #5 in the NCAA and joins 4 other men under the 45 second barrier. Behind Fantoni was Henrique Painhas (46.06) and IU’s Jacob Steele (46.13). After IU’s last 3 wins, the Hoosiers rebuilt a 67-point lead over Michigan with diving and the relay remaining. With the Big Ten title on the line, and needing a big score to pass his teammate Andrew Capobianco, Indiana senior James Connor put in a massive final dive. Doing his hardest dive of the day, a Reverse 3 1/2 Somersault Tuck (307C), Connor averaged 9.50s (with two 10s among the 7 judges) for a 99.50 point dive. That near-perfect final performance not only lifted him past his teammate for the title, but gave him a relatively-comfortable 16.50 point margin of victory. Purdue’s Greg Duncan took 3rd in the event: the team’s top finisher with defending champion Steele Johnson out on an injury. Duncan is a Purdue transfer this year, and was last year’s ACC Champion in this event. The Hoosiers took their 5th victory of the session in the 200 free relay. The quartet of Zach Apple (19.29), Bruno Blaskovic (18.88), Vini Lanza (18.91), and Brandon Hamblin (18.93) eclipsed the 2013 B1G record of 1:16.42. Taking a close second and also going under the B1G record was the Ohio State relay (1:16.36). Taking third was the Minnesota relay with a 1:17.24. The Hoosier’s record-breaking relay is now #5 in the NCAA, along with Ohio State’s #8-ranked relay. After losing ground in the 100 fly and 400 IM, IU has now regained a substantial lead over Michigan by 118 points. I like how in the picture Finnerty is wearing a Michigan cap. Wow, 44. Not bad for a kid from Albany! Well looks like Miles was the fastest Flier tonight. (More rested?